That Nokia will be holding a press conference at MWC is something we already know. We're also pretty sure that the Finnish company will be announcing new smartphones at the event. What we don't yet know, however, is exactly what handsets will be announced and what they will look like, but a patent application filed back in 2011 might hold some clues. 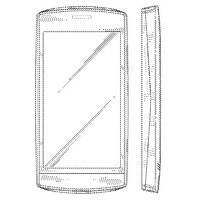 The patent for the design of a cell phone has been granted to Nokia on February 5, 2013. Judging by the images below, it is a touchscreen device, presumably a Lumia Windows Phone handset. There is no indication within the patent as to what model are we looking at, so it could be a mid-range smartphone or a high-end model of some kind – your guess is as good as ours. Interestingly, a smartphone looking a lot like the patented design has appeared in a Nokia concept video dating back from 2011. You can watch the video below. Of course, there is no guarantee that a smartphone designed like this will ever materialize. But on the other hand, this could be either the rumored Nokia Lumia 520 or Lumia 720. We'll know more on the matter later this month. can't wait to buy this beast!!!! Why do they say its a Lumia. It's definitely an Asha. Regardless of whether its a Lumia, Asha, or some other line they haven't come out with yet, its gonna be a damned good looking phone. Everyone is saying it's an Asha series and that's exactly why I was coming here to say that it does look like an Asha. And if I take a step ahead I say it could be a full touch of Asha 305. I hope it comes with better specs, as in wifi enabled. I was checking Asha 305 the other day that my cousin bought and that was not bad. He (my cousin) is pretty happy with it. He pick it over Samsung, said Samsung's keyboard was very tiny and hard to press compare to this one. I agree... this is not WP8... looks more like it will be an Asha series phone. I'll bet this is the hardware that the RM-860 firmware is going on. I doubt it's the EOS, i think it's the lumia 720. If nokia doesn't introduce the EOS in MWC i would be verry disapointed. THAT phone is the only one that would make me switch to WP8 in a heartbeat! Looks somewhat like Nokia 500..